Saint Anselm of Canterbury (/ˈænsɛlm/; c. 1033 – 21 April 1109), also called Anselm of Aosta for his birthplace, and Anselm of Bec for his home monastery, was a Benedictine monk, philosopher, and prelate of the Church, who held the office of Archbishop of Canterbury from 1093 to 1109. 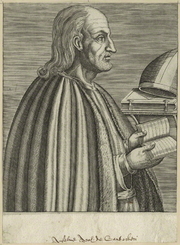 Anselm of Canterbury is currently considered a "single author." If one or more works are by a distinct, homonymous authors, go ahead and split the author. Anselm of Canterbury is composed of 62 names. You can examine and separate out names.